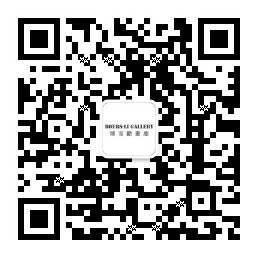 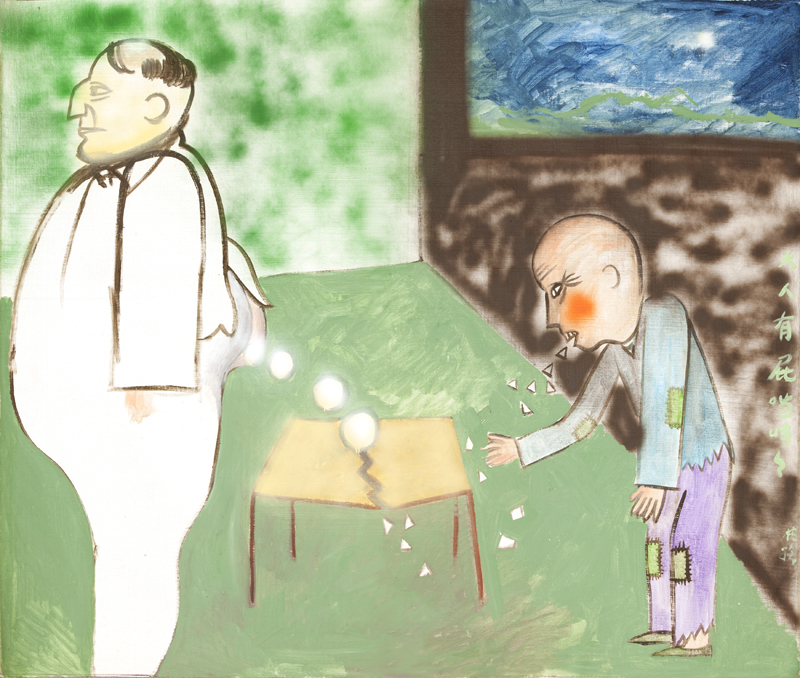 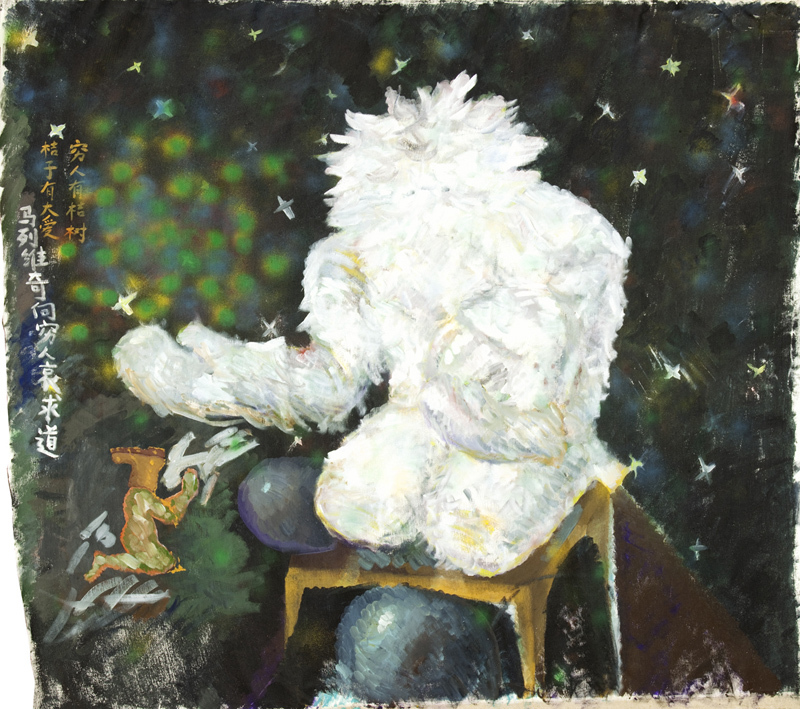 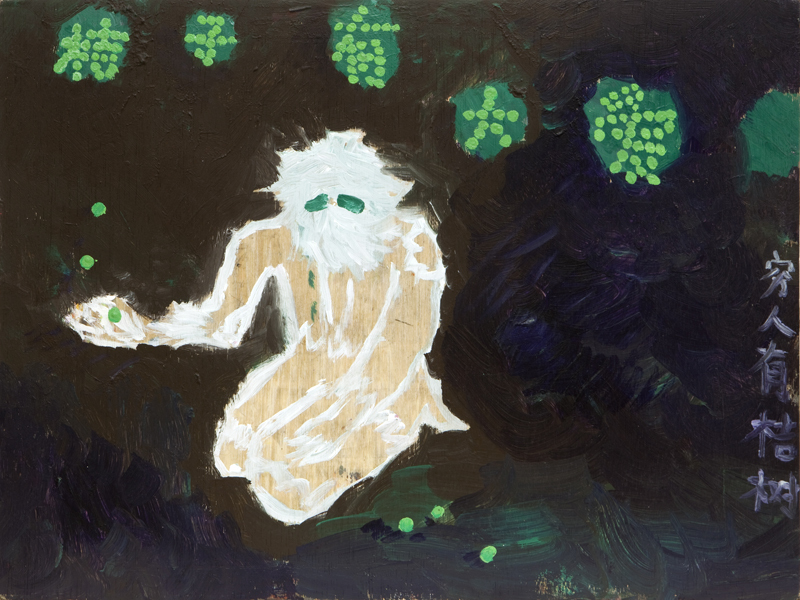 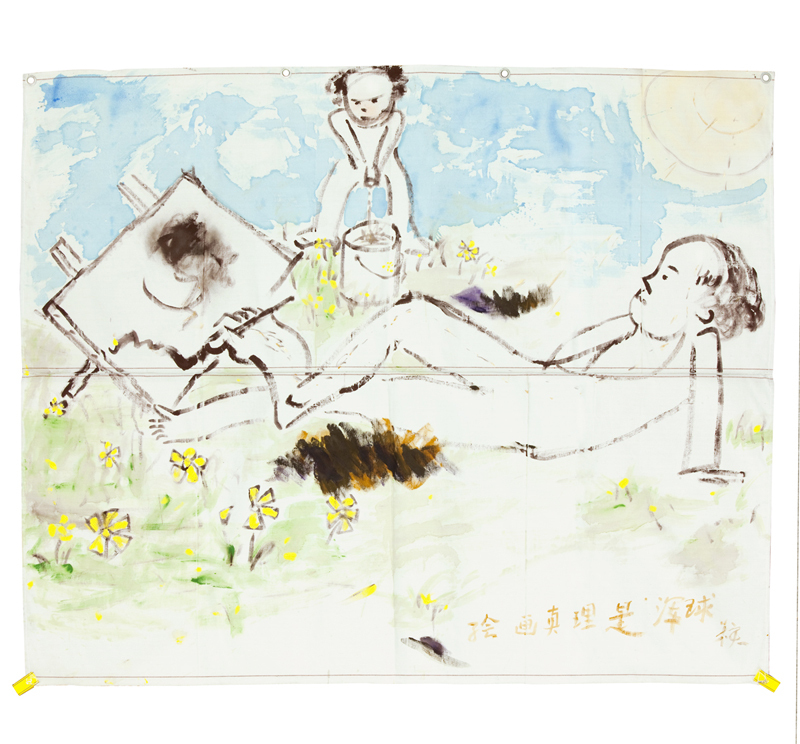 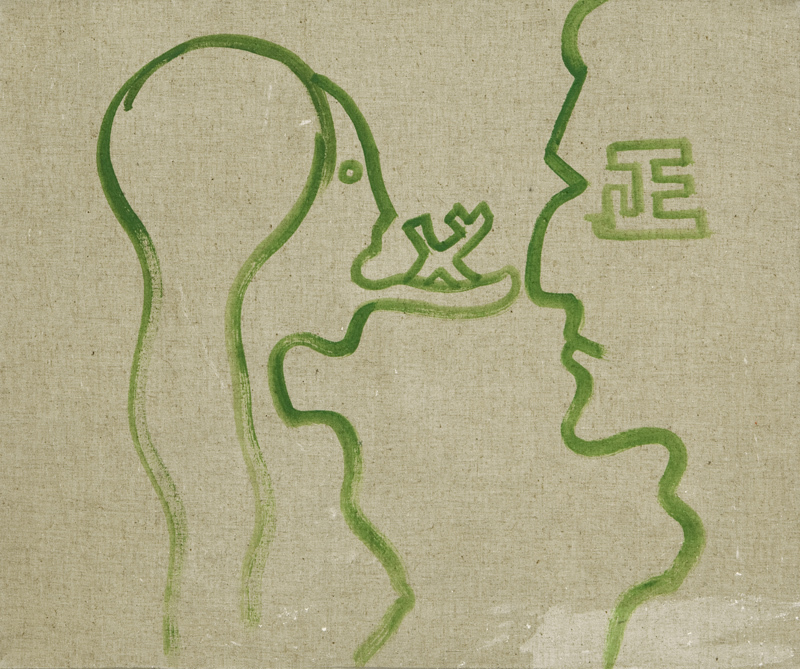 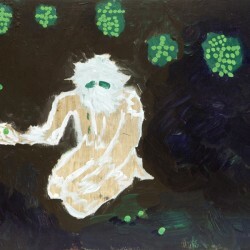 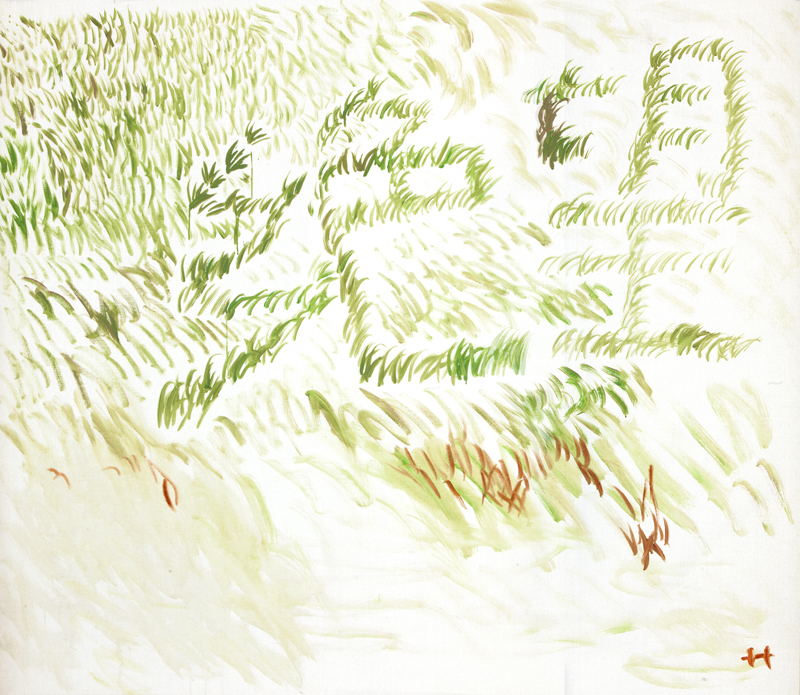 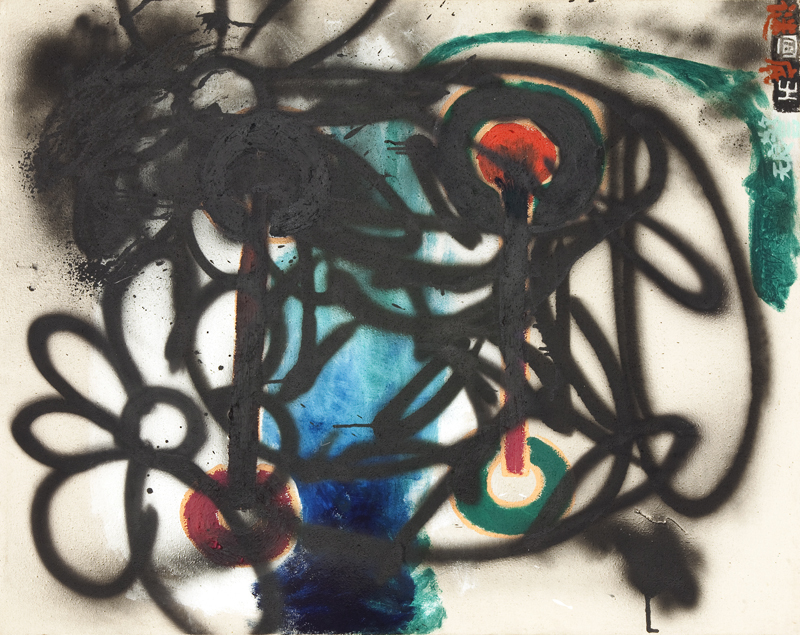 Boers-Li Gallery is pleased to announce the opening of Bananas, Eggplants, Meat Patties, Liao Guohe's solo exhibition at the gallery, on Saturday August 24th, 2013. 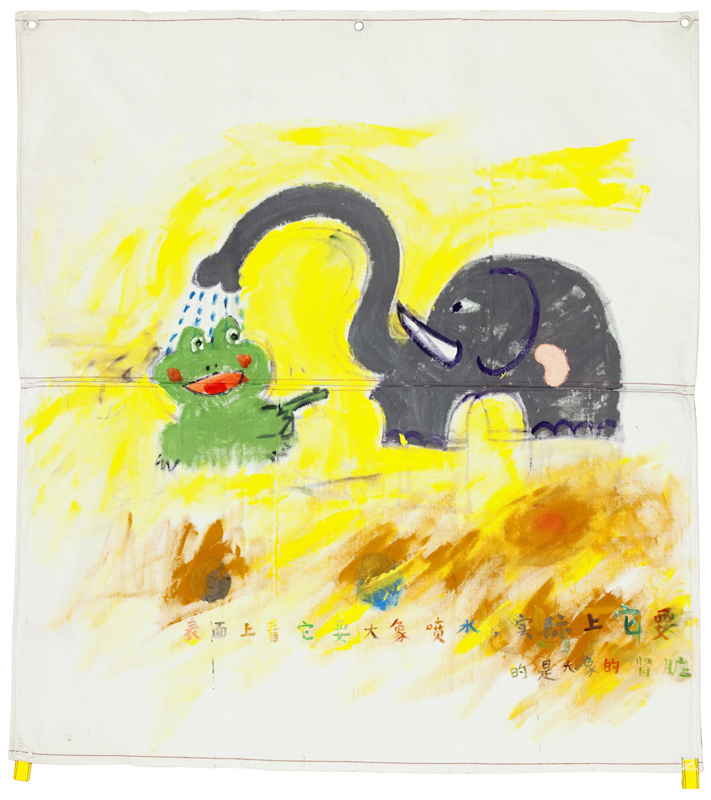 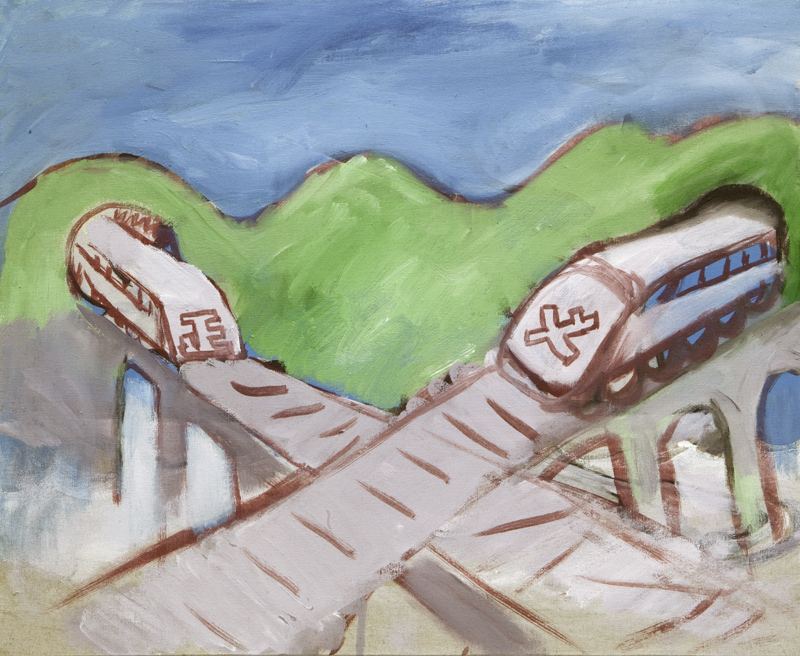 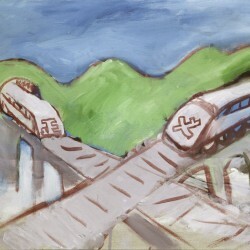 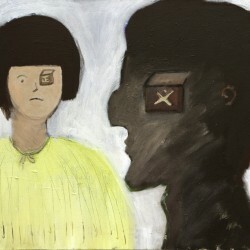 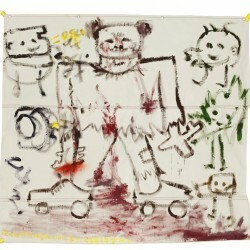 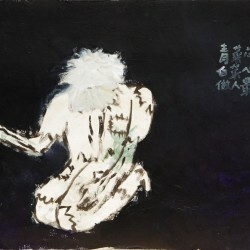 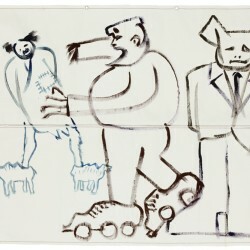 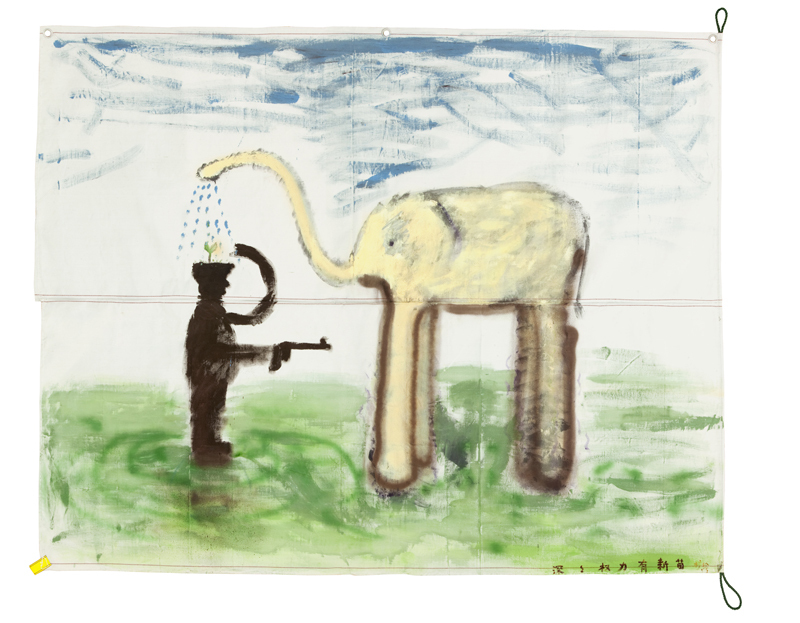 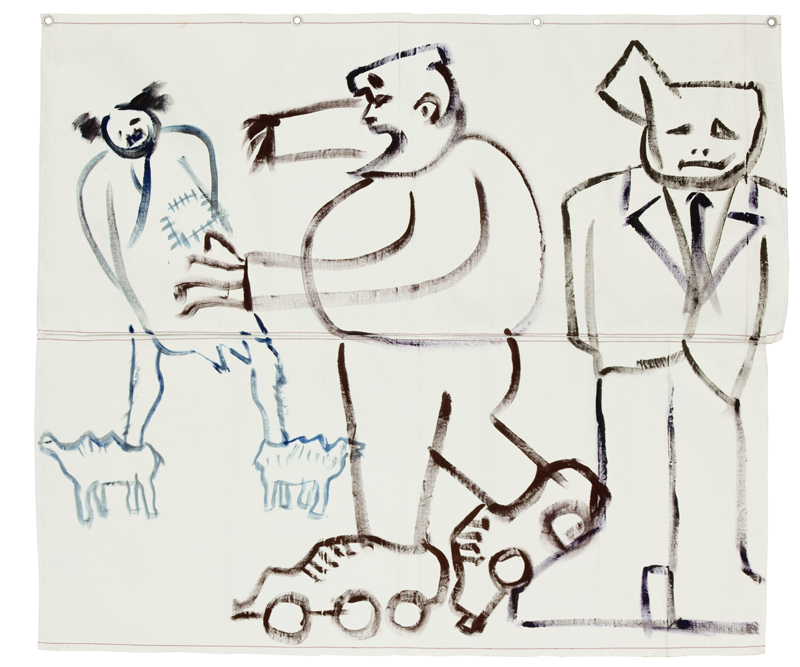 This is Liao's second solo exhibition in Boers-Li Gallery, and presents more than twenty new paintings.Just like the show's eccentric title suggests, this new exhibition is direct, unassuming, topical and humorous, and leaves the viewer to ponder after the bold, rough candor of the imagery. 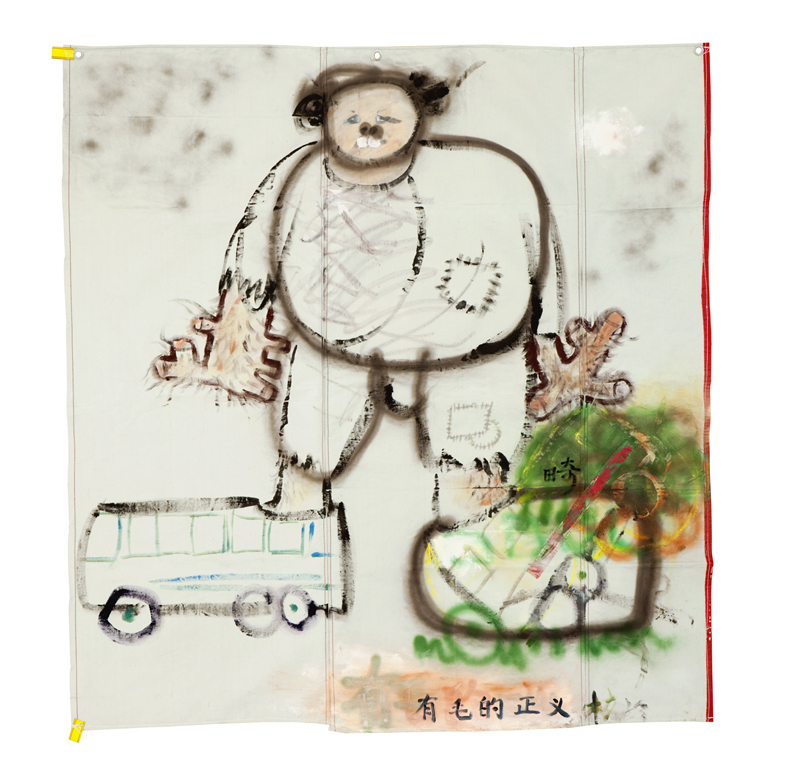 Liao's works focus to deliver a message, whether it's a social trend or a fictitious anecdote, through imagery and defiance of the "proper". 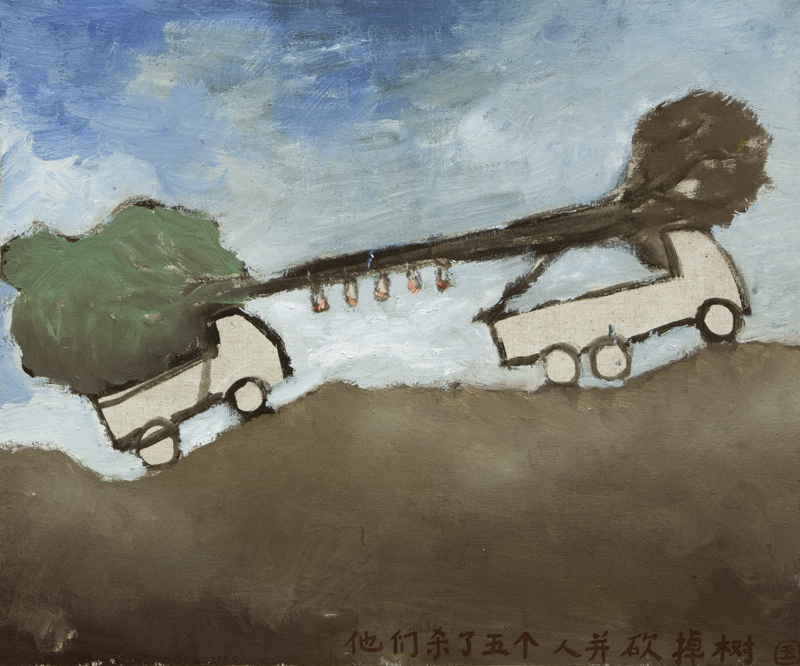 Unlike his earlier works, which duel on macroscopic issues in Chinese politics and society, his new works bring the viewers to an introspection of moral values. 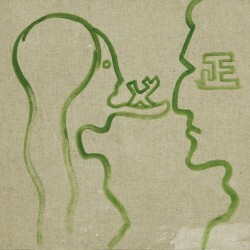 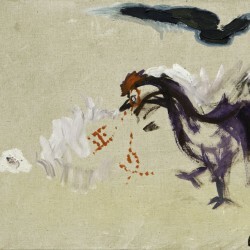 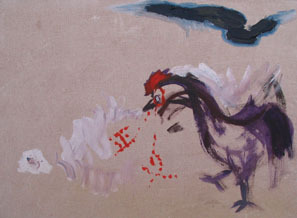 In a new series called Justice, the artist writes these Chinese characters in a comical interpretation of what and where "justice" could be: Coughed up red by a rooster, soaring in the sky as an avian formation, or on an appropriation of Mike Kelley's Twin Henrys' buttocks. 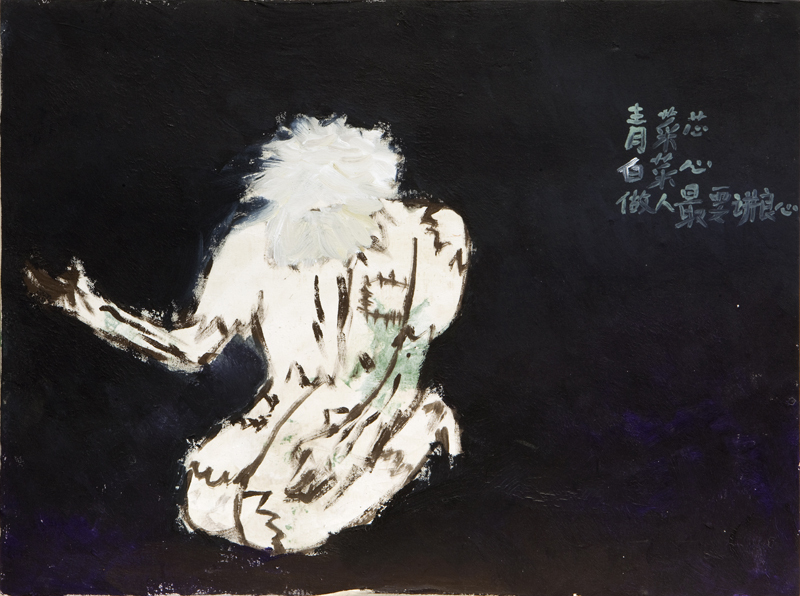 Through these brazen representations of "justice", Liao poses a light yet memorable channel of discourse to a conventionally weighted theme. 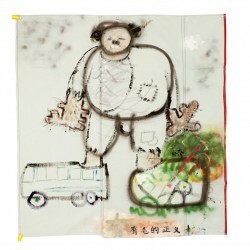 Moreover, in this exhibition, Liao experiments with industrial linen cloths as canvas in place of the usual canvas for art. 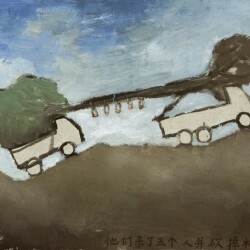 This combination of rough texture with harsh brushstrokes reflect the stereotypes of bad taste related to the working class. 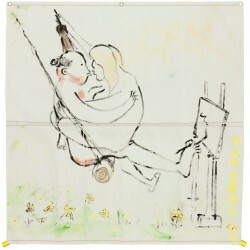 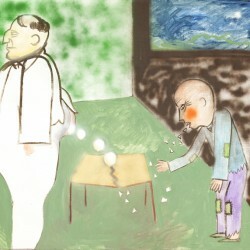 In The Truth of Painting Blowing Gently, an old bald man cuddles with a blond woman in a swing, rocking gently as the "truth of painting" breezes by while he carelessly "paints" on a canvas with his feet. 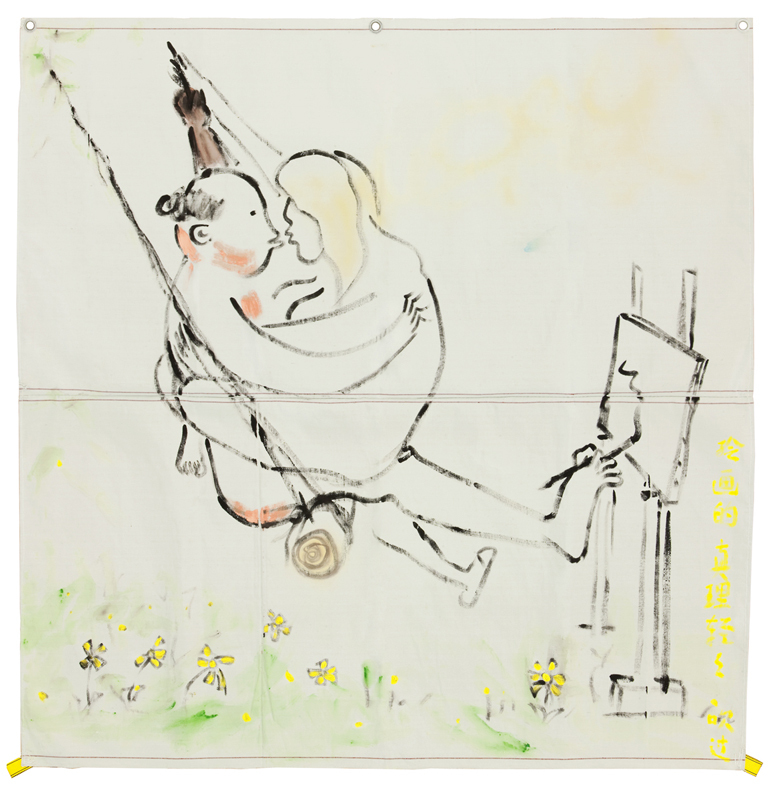 The goofy content and sexual innuendo ridicules and questions the definition of painting and the current environment of art. 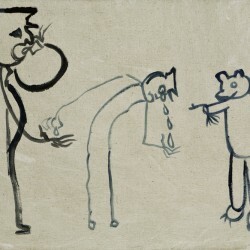 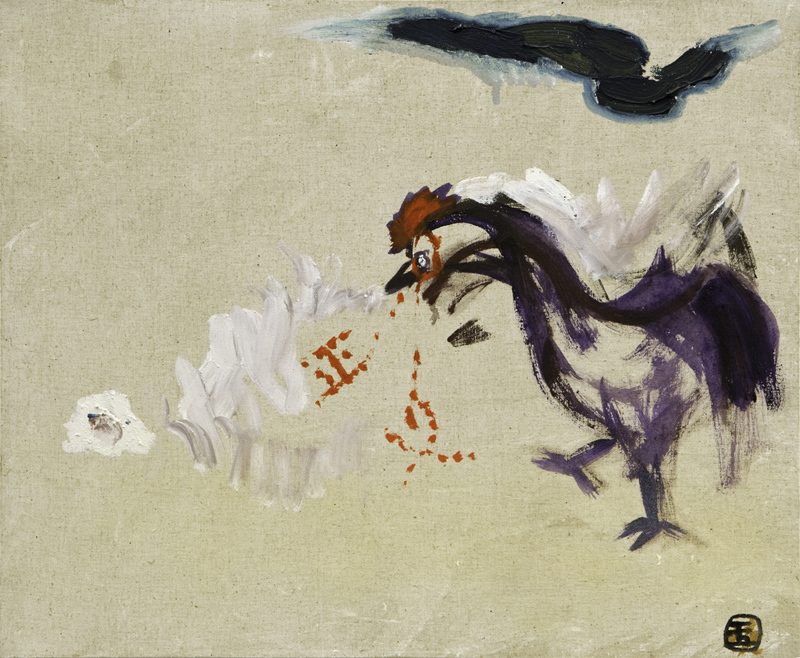 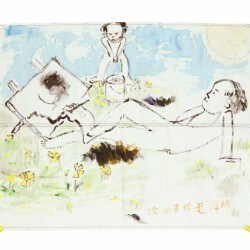 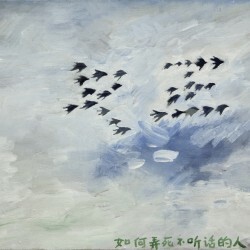 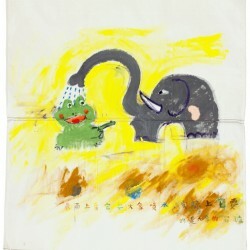 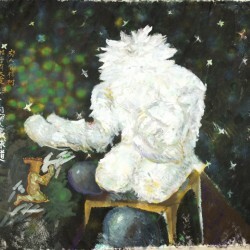 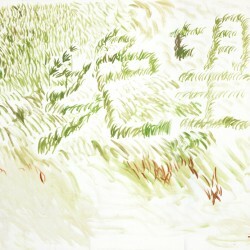 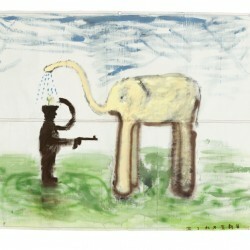 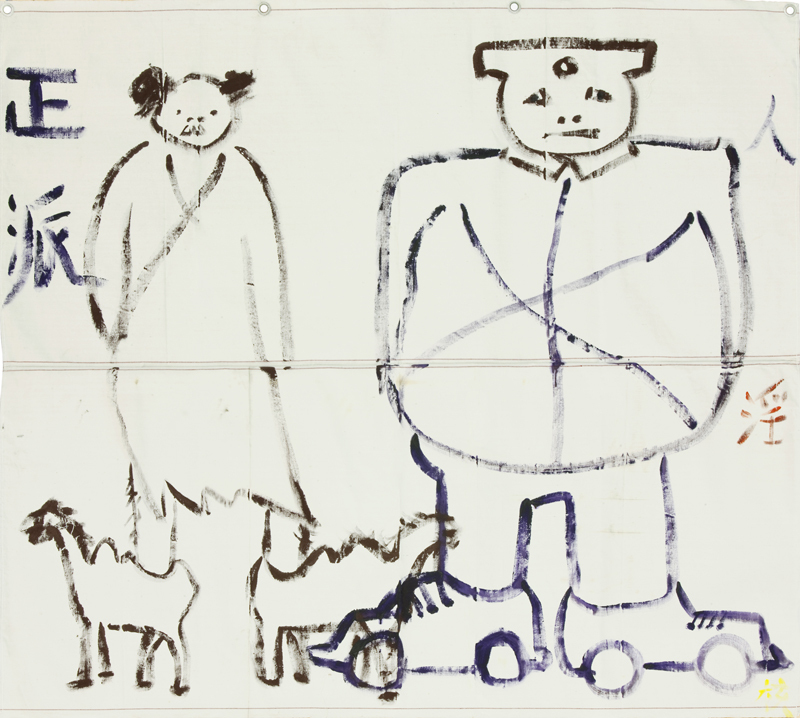 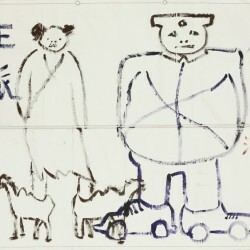 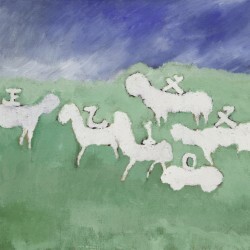 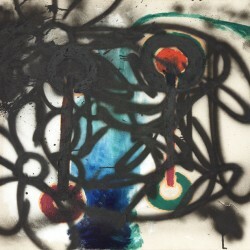 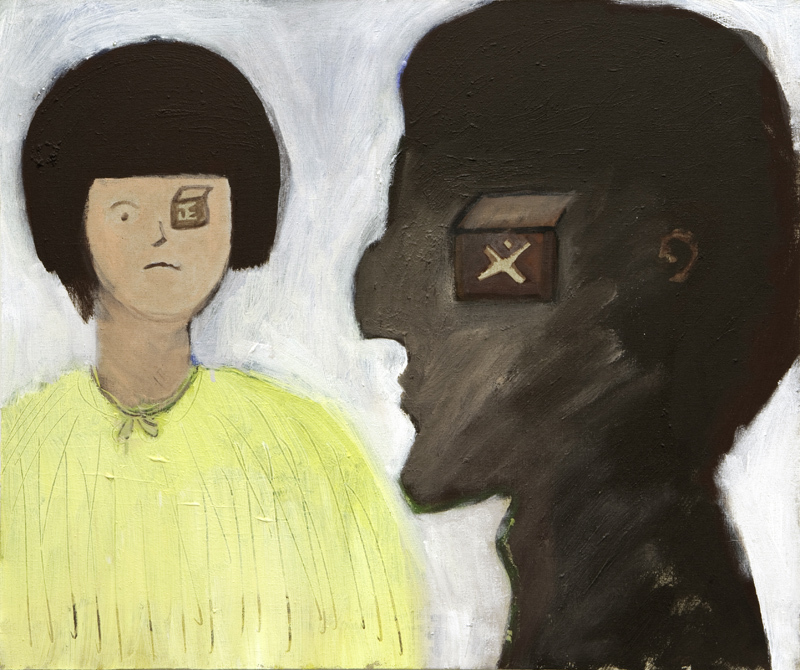 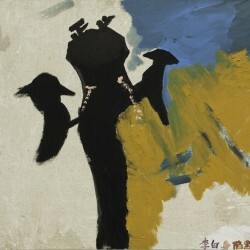 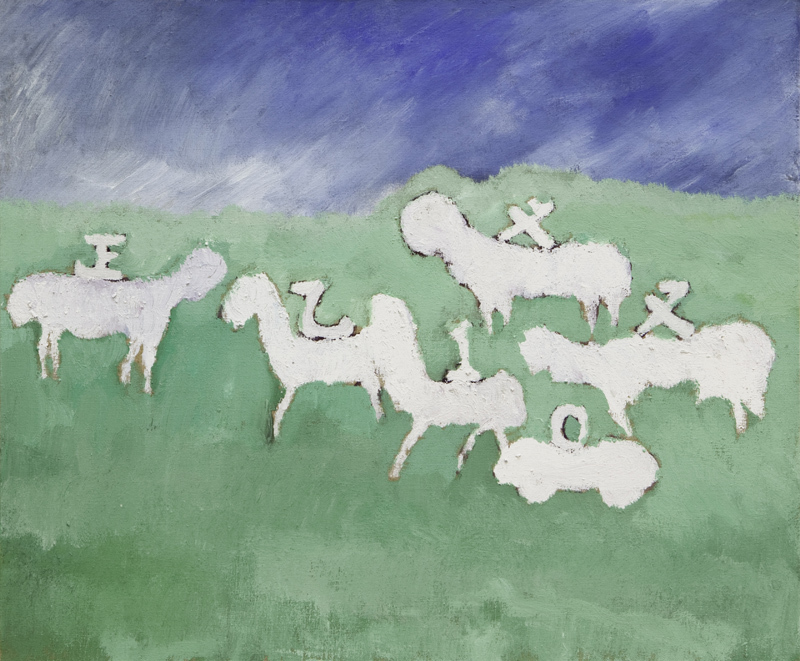 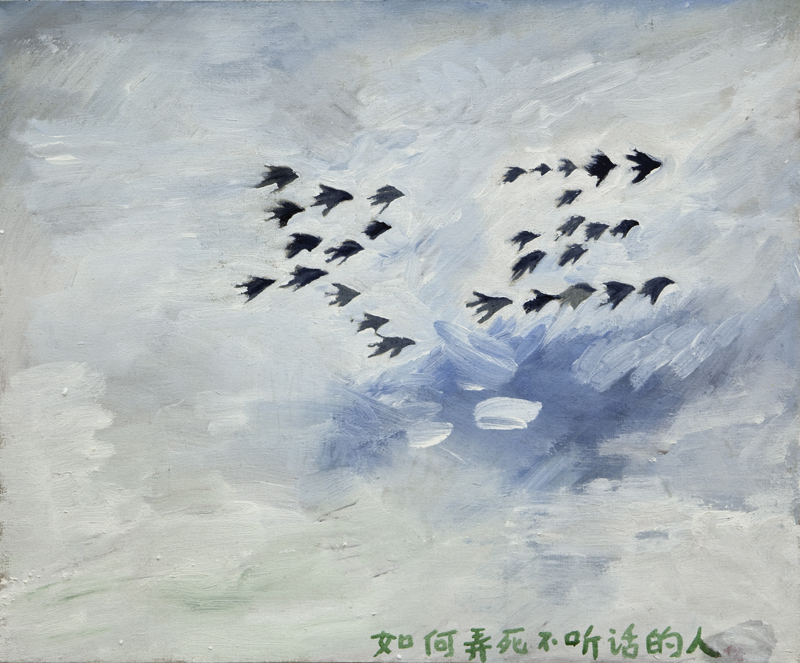 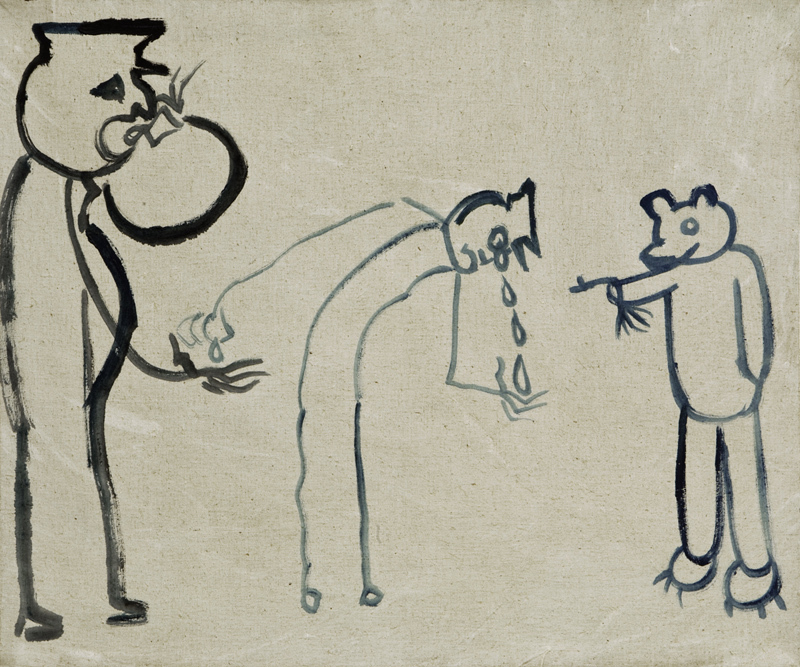 Liao Guohe's playful, unruly, yet determined attitude toward art is expressed directly through his paintings. 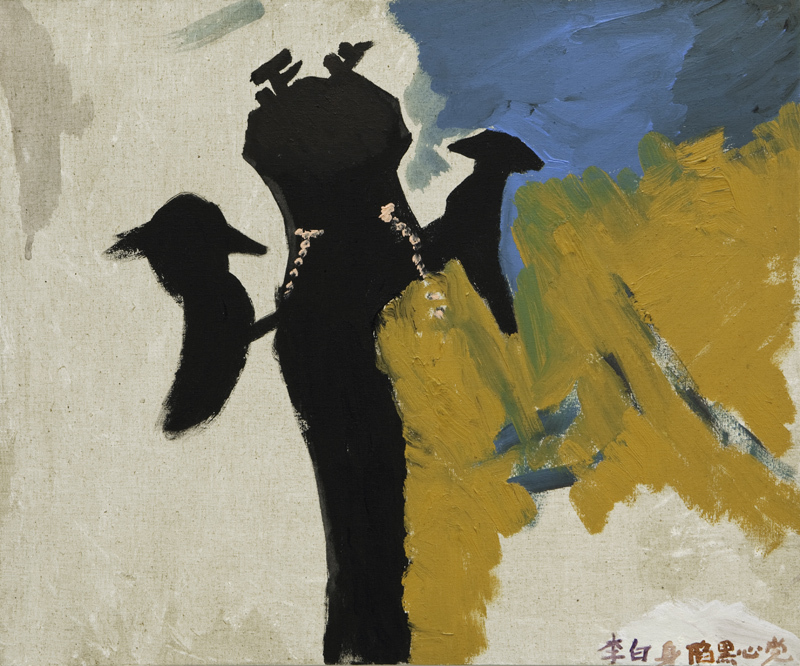 Despite having a deep understanding of what the traditions of Chinese ink and Western oil paintings are, Liao chooses to bring his art away from the polished recognizable symbols of painting, and derives his works from a simplicity familiar to the average working class. 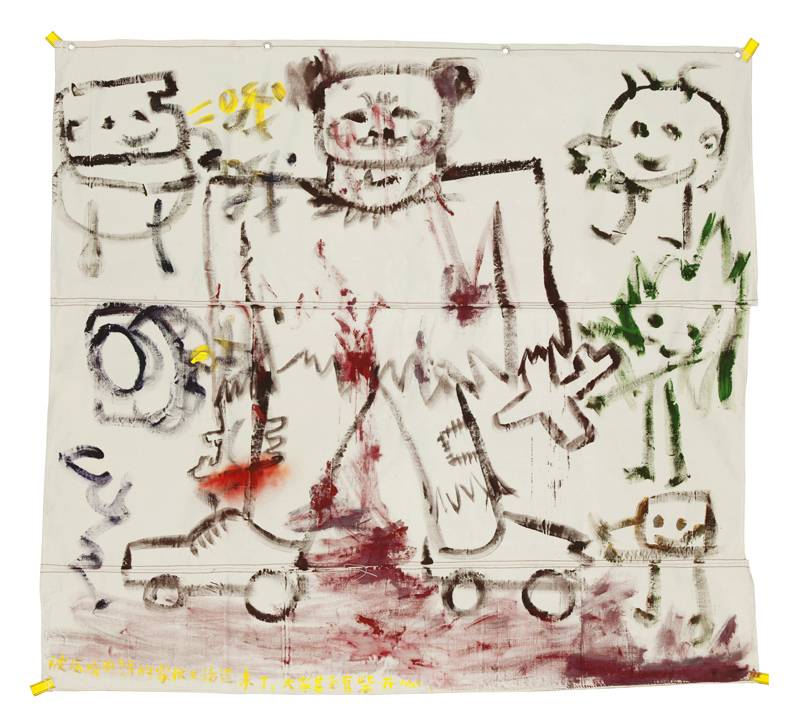 His paintings identify with the traditions of "bad painting", but evolves beyond just that: It is through his free,rebellious and unconventional strokes and forms that the underside of society and its passionate and prosaic rhythm shines through.